MP4 Converter is the powerful application to convert your music and video files from MP4 to MP3 format. No matter if you're trying to convert music, audio books, videos, DRM-protected files. This MP4 to MP3 converter will help you get MP3's from any media file that can be played on your computer. Do not waste time - check MP4 Converter features list and software editions available. Why do you need MP3 format? MP3 files are small audio files that offer good sound quality and doesn't take a lot of disk space at the same time. They can be played on any nowadays digital audio player or software. MP3's can be easily created using a home computer - a CD ripper application that converts audio track to your PC. Or you can get MP3's from digital audio store. With MP4 Converter you can turn any media files into generally used MP3 format. MP4 file extension is used for storing both digital audio and video data. You may frequently get MP4 files via digital media store. Thereby the files may turn out to be secured with DRM protection. This type of media files is widely used for high quality media streaming over Internet. Anyway, you can get rid of DRM protection and MP4 format converting MP4 to MP3. The main reason users convert MP4 to MP3 is to extract audio files from MP4 to a more compatible and easier to user format. Run MP4 Converter from either shortcut on your desktop or Program Files menu. Open MP4 Converter settings clicking "Settings" button in the program window and select your conversion purpose in software settings. Find "Encoder for video files" field, click on drop-down list and select "MP3 Audio". This is a fixed preset for MP4 video to MP3 conversion. 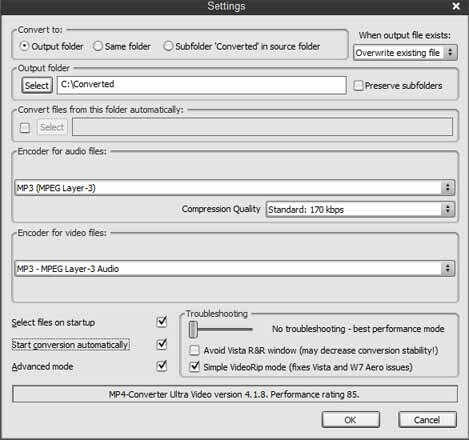 To convert MP4 audio files to MP3, select MP3 encoder from "Encoder for audio files" list. Don't forget to set the output folder location in settings window. This is where your converted files will be located. Close MP4 to MP3 Converter settings and add the desired videos into the software window. The conversion will start immediately. Find your converted files in the output folder, connect your mobile device to PC and transfer MP3's to it. Our program can easily save your video clips as an audio track, all you need is convert MP4 to MP3 audio and enjoy audio tracks on any portable player or audio editing software. The most of the files that are sold via digital media stores, streamed online are not MP3 files. For instance, when you download music videos or video bootlegs, besides watching the video on your TV screen, you would like to take it with you to MP3 player. So, in case you need to get audio from video, download MP4 to MP3 Converter software and convert from MP4 to MP3 easily and effortlessly into compatible and easier to use media format. MP4 to MP3 converter will help you convert MP4 songs with DRM protection. For all of those who purchased DRM iTunes music online, our program can unprotect your songs and convert MP4 to MP3 format. It is an extremely fast and easy audio converter. Audio files are converted in parallel mode, so you will for sure save a lot of time converting the large music library. Do you want to download and convert YouTube video to MP3 format? This is not a problem anymore when running MP4 Converter. The Ultra edition of the program contains YouTube video downloader. Find the download button right in your Internet Explorer window and watch all your favorites converted to MP3. MP4 Converter software is safe to install and use. Download the trial version now and convert your entire media library effortlessly! We offer solid 30-days money back guarantee for MP4 Converter software. If you're not happy with our product, the full amount will be returned to your credit card.